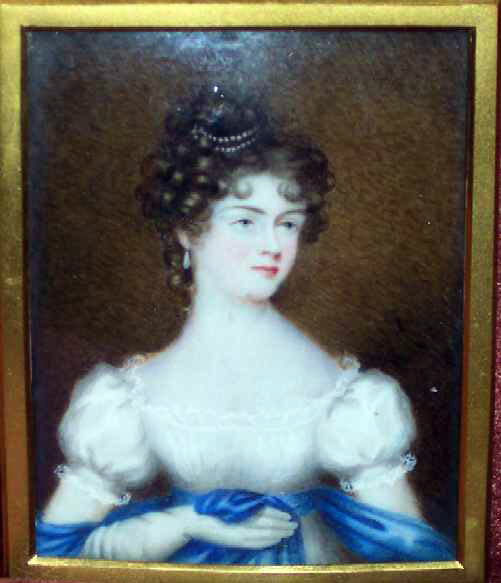 Presented here is an exceptional miniature portrait on ivory of a very beautiful young woman. It dates from 1800-1810 and reflects the fashion of the day. The sitter's name is written on the back of the silhouette and appears to be Andrina Robertson as nearly as I can tell as it is written in pencil and not all that legible. The detail work has the esthetics and painterly quality of a very accomplished artist and I'm certain that our young woman must have been very pleased with the result. Size is 2-3/4" x 3-1/2".